Influencer marketing is no longer up and coming: it’s here, and it seems as though it’s here to stay. Agencies that promote and encourage the use of influencer marketing have seen a rise in success rates recently, further reinforcing the idea that this concept is worth a second look by companies that may have questioned the tactic before. Further legitimizing the importance of influencer marketing is JMRConnect, a multinational public relations, corporate and influencer communications agency. The company announced today that it was just recognized in a big way by The Holmes Report. 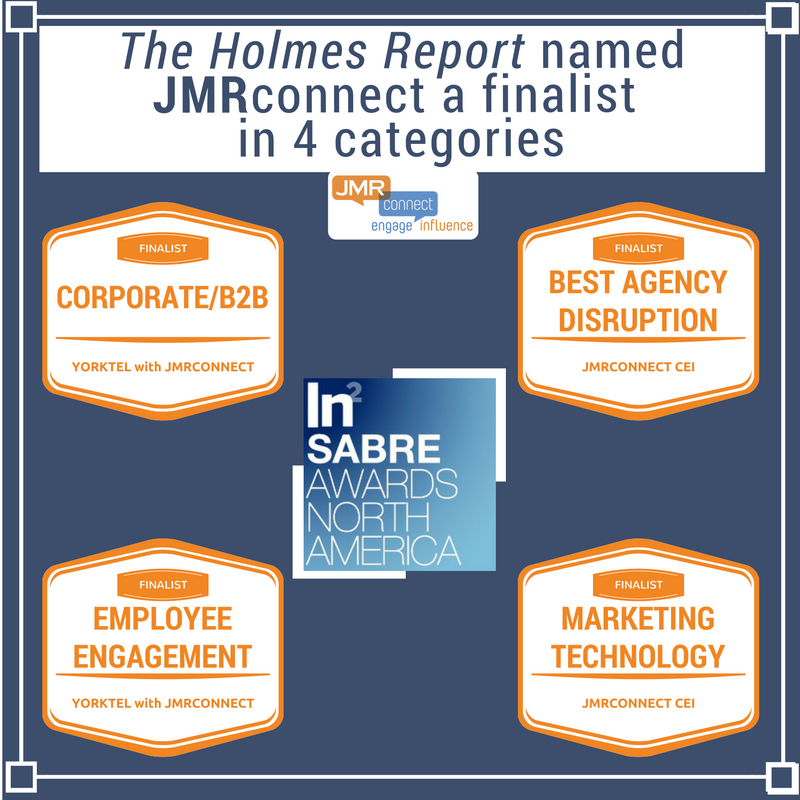 The Holmes Report has named JMRConnect a 2017 North American Innovation & Insights SABRE Awards finalist in four categories: Best Agency Disruption; Corporate/B2B; Employee Engagement; and Marketing Technology. These nominations are a direct result of the company’s JMRConnect CEI solution as well as the results achieved by JMRConnect’s client, Yorktel. CEI—which stands for connect, engage, influence—is the agency’s social engagement, employee advocacy and content marketing platform which empowers companies to get the most out of influencer marketing. By using CEI, businesses can easily help their employees become influencers. Content is sent directly to these influencers, and they can share it with the simple click of a button. This allows companies to get more involved with its employees, and for those employees to feel like they have a bigger role in the company—it’s a win for everyone, especially since there’s free word-of-mouth marketing involved. Aside from the success of this solution, JMRConnect also received so many nominations because of its relationship with Yorktel. The two companies put together YorktelShare, an employee advocacy campaign powered by CEI and executed on behalf of Yorktel, which found massive success in 2016. Content sent out through YorktelShare was shared by individuals more than 2,000 times on LinkedIn and 3,000 times on Twitter, which resulted in more than 22,000 click-throughs and $59,000 in advertising equivalence. The success of CEI and YorktelShare can be attributed to the rising importance of influencer marketing. At the end of the day, consumers prefer recommendations from their peers over advertising from companies; they find word-of-mouth recommendations to be more genuine and believable. Since posts from both platforms appear as first-person referrals rather than ads or promoted content, people believe the reviews and, consequently, companies using the system are able to build brand credibility and expand their reach. As the name CEI suggests, it is essential to connect, engage and influence in order to be successful in any and all marketing efforts. Based on these nominations, I’d day JMRConnect doesn’t need any help in those departments.